Arthropods are invertebrate animals with an exoskeleton, segmented body, and jointed appendages. The phylum Arthropoda includes insects, arachnids, myriapods and crustaceans. Arthropod species make up more than 80% of all living animal species. This tarantula got its name from an explorer who spotted one eating a hummingbird, but their diet rarely consists of birds. 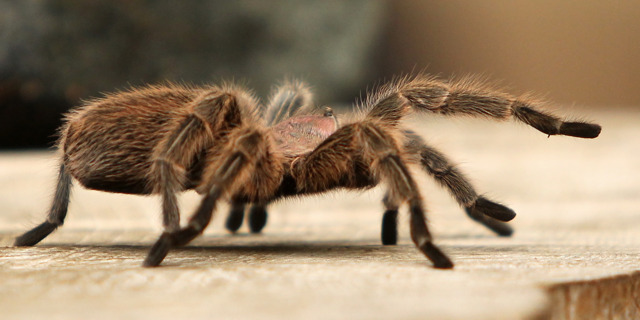 Bird-eating tarantulas are the heaviest of all spiders and the second largest. They have inch long fangs which they use to infect venom into their prey. A bite would feel like a wasp sting to a human but it paralyzes its small prey. The tarantula then secretes digestive juices into its prey that turns its insides into liquid. Everything the tarantula eats must be in liquid form. Bird eating tarantulas do make webs, but they are not used to catch prey. They are used for shelter and protection. 50% of males are killed or injured during mating, which explains the dramatic difference in lifespans. You can visit our tarantula in Unseen New World.